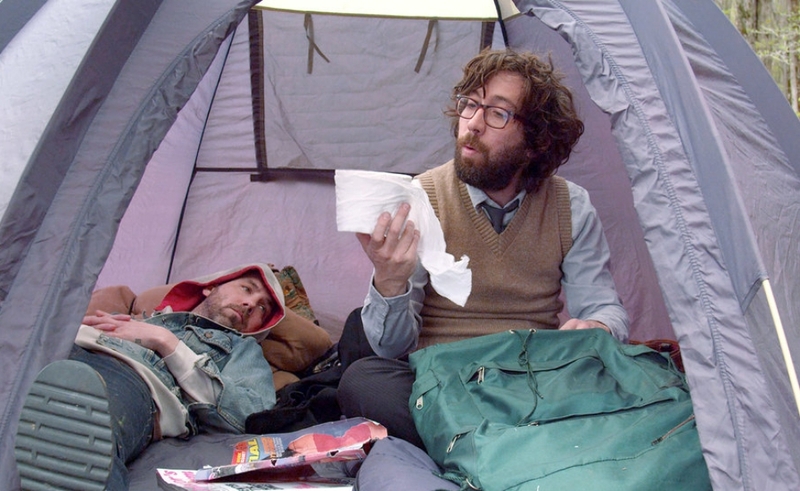 Refreshingly unafraid to invite direct comparisons, writer-director Eddie Mullins includes a list of “relevant films” in the press notes for his indie comedy Doomsdays. Among his inspirations? Down By Law, Withnail & I, Songs From The Second Floor, Two-Lane Blacktop, Vagabond, and Jean-Luc Godard’s Weekend. Those are some outstanding movies to aspire to; and while Doomsdays doesn’t rise to any of their levels, their similarities to Mullins’ debut is unmistakable. To those, add the Marx Brothers, Bottle Rocket, Jules And Jim, Jackass, Penelope Spheeris’ Suburbia, and Larry Clark’s Wassup Rockers. The Clark comparison may spring to mind because Doomsdays stars Leo Fitzpatrick, who first made his mark in Clark’s Kids—another movie with which Doomsdays shares some kinship. Fitzpatrick plays Bruho, a nihilistic pessimist who’s convinced that society is just a few years away from reaching “peak oil,” after which billions will die and the world will slide into chaos. He’s decided to beat the rush and start living like a nomadic scavenger now, while there’s still plenty of food and booze to scrounge. So he heads up to the Catskills with his buddy Dirty Fred (Justin Rice, from Andrew Bujalski’s Mutual Appreciation). Fred’s less certain that the end times are nigh—he’s pretty sure that humanity will find a way to adapt—but he’s enough of a slacker that he can’t say no to free stuff. Together they hike from one vacation property to the next, breaking in and staying as long as they can, until they either run out of supplies or run into the owners. Mullins doesn’t explain Doomsdays’ premise right away. For roughly the first 25 minutes, Bruho and Dirty Fred just go around wreaking havoc for no apparent reason—getting drunk, slashing tires, and looking for women. Or rather, Fred goes looking. In the Marx Brothers analogy, he’s part Groucho and part Harpo. He talks constantly, trying to dazzle the people they meet with his wit; but when he sees a pretty girl, he goes running out of frame, on the chase. Most of Doomsdays’ comedy derives from the framing, as Mullins holds the camera in a fixed position throughout a scene and has his characters walk into the distance whenever they do anything that could be construed as “action.” They look adorably tiny as they’re breaking and entering, or when they’re punching anyone who asks what the hell they’re doing. Doomsdays’ plot—such as it is—arrives when the boys meet Jaidon (Brian Charles Johnson), a hapless, friendless younger oaf who finds out what they’re doing and starts inviting himself along. With a new member on the team, Bruho and Dirty Fred have to come up with justifications and guidelines for their way of life. No sooner have they laid out an ethos then they find another recruit, Reyna (Laura Campbell), a sunny, spunky local whom Fred seduces. Whatever on-the-fly rules they came up with for Jaidon they then have to extend to Reyna, until their anarchic impulses start to fade into a miniature version of the society they were trying to escape. Bruho bristles, particularly when he figures out that Reyna is more special than the selfish, impulsive Dirty Fred realizes. He doesn’t want her to be another precious resource that gets squandered. Mullins doesn’t really have very many places to go with this story once he’s set it up. By the time Reyna appears, Doomsdays is almost at its halfway point, and since this movie is too low-stakes to throw in any heavy plot twists, it can really only coast to a stop after it’s introduced all the personnel. But for a film so slight, Doomsdays makes a strong impression. The nicely composed, beautiful-looking country houses—far enough away from any town big enough to have an active police force—make a fine backdrop for the fantasy of idleness and consequence-free destruction. And because the whole movie takes place over the course of a month, Bruho and Dirty Fred’s clearly unsustainable plan doesn’t strain credulity. Most importantly, these four characters are well-acted and well-drawn, not just serving a comic purpose but showing enough hints of emotional depth to make them more dear. Bruho’s restlessness, Dirty Fred’s glibness, and Jaidon’s clumsiness are all masking varying degrees of depression and disappointment. And then Reyna bounces in, with a different perspective on everything, from how much fun it is to be an outlaw to what’s really going to set off the apocalypse. (She’s more of a “singularity” gal.) Give Mullins credit for understanding that what makes his favorite movies work isn’t that they’re stylish or weird, but that they describe something true about human nature. It’s not that hard to imagine Doomsdays connecting with the next wave of young filmmakers who want to turn angry alienation into something funny, poignant, and easy on the eyes.